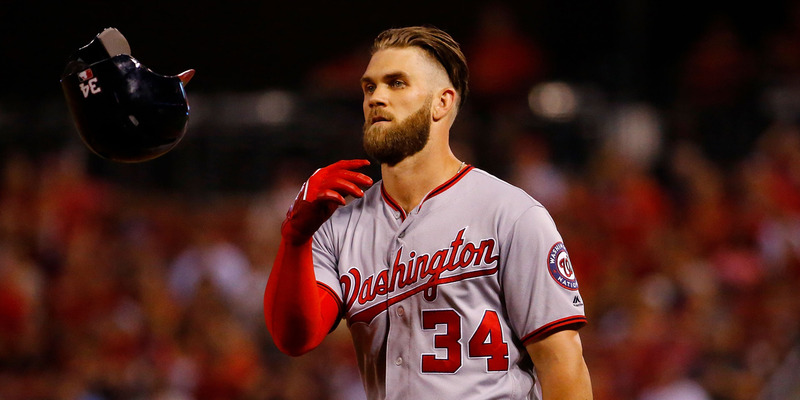 Dilip Vishwanat/Getty ImagesThe Washington Nationals were heavy favourites to win the NL East heading into the 2018 season, but now find themselves on the outside looking in of the postseason picture. The Washington Nationals are in a tailspin, having lost five of their last seven games including back-to-back walk-offs in the midst of a crucial stretch. The Nationals were heavily favoured to win the NL East, but now face an uphill battle in the division, trailing the Atlanta Braves by seven games and the Philadelphia Phillies by six with just 43 games left to play. While they sport a strong lineup and starting rotation, their bullpen has now turned two straight wins into losses for Washington. The Washington Nationals are falling apart at the seams. With just 43 games remaining in their season, the Nationals have lost five of their last seven games including back-to-back walk-off losses and now find themselves trailing in the NL East by seven games, behind both the Atlanta Braves and the Philadelphia Phillies in the division they have won two straight years. As things stand, FiveThirtyEight gives the Nationals just a 17% chance to make the playoffs – a dramatic and disappointing drop from the 81% shot at the postseason they were given at the start of the season. The Nationals decline feels almost illogical. They sport a starting rotation that includes ace Max Scherzer, their lineup is anchored by the reliable power of Bryce Harper, and 19-year-old Juan Soto is tearing through the majors with a remarkable rookie campaign. But despite the strength of the team on paper, something has simply not been clicking for the team this year. They have a +69 run differential but have lost a whopping 21 one-run games, and after Sunday and Monday’s back-to-back walk-off losses, it’s hard to look anywhere but the injury-ridden bullpen when assigning blame for the Nationals’ woes. The heartbreak started Sunday when the Nationals took a 3-0 lead into the bottom of the ninth against the Chicago Cubs. Closer Ryan Madson came in to finish out the game but instead set up the scenario little league players around the world imagine while they practice in batting cages – two outs, bases loaded, bottom of the ninth, one home run to win the game, and the home team down to its last strike. Cubs rookie David Bote wrote a pitch-perfect ending to the script – smacking a home run to centerfield to send the crowd home happy and leave the Nationals to regroup and wonder what had just happened. The next night the Nationals were in St. Louis and looked in position to bounce back against the Cardinals, taking a 4-2 lead into the eighth inning. Then, relievers Justin Miller and Sammy Solis combined to give up four runs to swing the lead away from Washington. The Nationals would tie the game with two runs in the ninth before reliever Koda Glover gave up yet another heartbreaking walk-off. For a team that has been attempting to fight its way back into the postseason hunt, the back-to-back walk-offs are about as demoralising as a stretch can get. There’s still a chance for the Nationals to get hot and make a run at the playoffs, but it’s now looking like an extremely uphill battle. Washington has nine games left against the Phillies, but just three remaining against the Braves, meaning the Nationals will likely need some help from Atlanta if they’re to make a run at the division. Most importantly, the Nationals need to figure out a way to right their bullpen’s current tailspin. After years of disappointing playoff finishes, Washington now is fighting just to make it back to October.